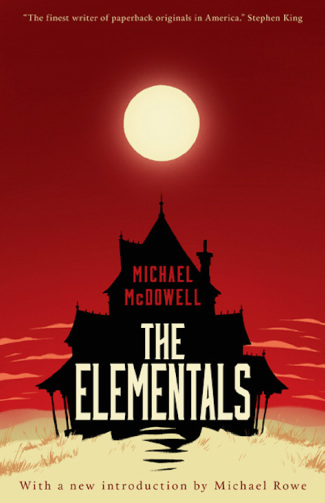 Michael McDowell’s reprinted 1981 novel The Elementals conclusively answers a question that I’ve been wondering for years: why are there so few classic haunted house stories? I’ve always been a fan of such stories, or more generally “old dark house” stories, as Orrin Grey refers to them in the introduction to Benighted. However, until recently I could only think of a handful of truly classic ones at most, such as Shirley Jackson’s The Haunting of Hill House (1959), Richard Matheson’s Hell House (1971), and of course Stephen King’s The Shining (1977). The answer to my question? It turns out that many great “old dark house” stories, like the houses featured in them, have been lingering in obscurity, unattended to, dark and silent, waiting for someone to come along and uncover their secrets. Valancourt Books has done an admirable job bringing many of these stories to light recently; I have spoken fondly in the past about Jack Cady’s The Well (1980), and I have now been blown away by The Elementals. The novel begins at the funeral of Marian Savage, the matriarch of the venerable southern Savage family. After the ceremony — which includes an unscheduled, bizarre and horrifying interlude — the Savage and McCray branches of the family decide to head down to the Alabama coast for the summer, to the remote and aging refuge of Beldame. There, three Victorian houses stand: one each for the Savage and McCray families, and a third that is abandoned and slowly being consumed by a massive sand dune. Nobody knows, or seemingly ever knew, who owns that third house. The summer begins pleasantly, but 13 year old India McCray grows curious about the empty home. Despite the warnings of Odessa, Marian Savage’s long-term and now former housekeeper, India starts to investigate, at first only drawing close enough to peer in the windows and photograph the building. But something exists in that house, something that terrified the elder members of the Savages and McCrays in their youth and may have taken lives of family members in the past. Something that is not human, and was never human, and has now started to awaken. The Elementals is a brilliantly atmospheric book, with an oppressive feeling of dread and a few genuinely horrifying images that still haunt me a little to this day. I won’t spoil any of these surprises, but one of them is a shocking event in the early history of the Savage family that resulted in the macabre tradition carried out in the funeral at the beginning of the novel. The history of the family is wonderfully described, and the family as a whole feels like a single living, breathing organism. Each of the members has a history, motivations and personality that was clearly thought-out in painstaking detail; in the future, I will use this novel as a model of proper character development. Of particular note is India McCray, who has grown up with her father in New York City, and has a jaded view of the world that makes her seem far wiser than her years. Her interactions with Odessa Red, a very traditional old woman who knows something of the horrors of Beldame, are also worth paying attention to. As in all good haunted house stories, the house itself is really the main character. The third house at Beldame is effectively presented as a looming, lurking presence that always casts a shadow over the family, even when they don’t know it. The house is also seen as always watching, and always waiting. The only weakness I find in many “old dark house” stories is in the ending: after so much build-up, it is often hard to bring things to a conclusion in a way that is satisfying but also does not destroy the mystery of the rest of the book. The Elementals also has a bit of a challenge in this regard, but it has a spectacular finale that works very well. I was completely unaware of the works of Michael McDowell (1950-1999) before reading this book, but I should have paid more attention: he is perhaps best-known for writing the screenplays for Beetlejuice and The Nightmare Before Christmas! I will definitely be reading more of his work in the future; Valancourt has also reprinted his 1979 book The Amulet, and looks to be reprinting at least one more in the future. Overall, The Elementals is a fantastic book of horror both subtle and not-so-subtle, and has beautifully imagined and sympathetic characters. It is highly recommended! I enjoyed The Elementals immensely. I couldn’t help but notice that the name of the area where the homes are located, is called Beldame (maybe a play on the word, bedlam?). Also, the use of the elements–earth (the sand), wind, fire (towards the end) and water (probably, next to the sand the most intriguing). The color red seems to play a role in the book. I finally bought a copy for the high school library where I work.